We love creating shutters for bay windows, as for our clients it is often a difficult window area to dress. Using our bespoke plantation shutters we can perfectly fit our shutters to the curvature and individual panels of the window perfectly. Not only do our bay window shutters look perfect from inside and outside of the home, but function in a neat and useful way throughout the day compared to more cumbersome curtains. 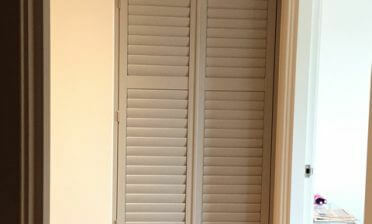 These shutters were installed by Mike and Roy in Chigwell, Essex. Bay windows are a great feature usually found on older properties which really make great use of natural light, streaming it in through living rooms, bedrooms and other areas from all angles. 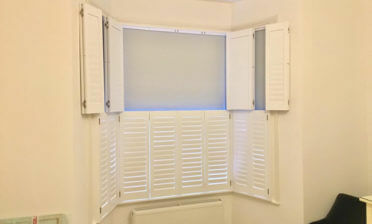 Another reason why our shutters are perfect for the job, as each panel can be separately opened, closed or adjusted depending on the light required for the room. We created these shutters using MDF also known as our Antigua range, which makes for a more cost effective solution without compromising on quality or looks. 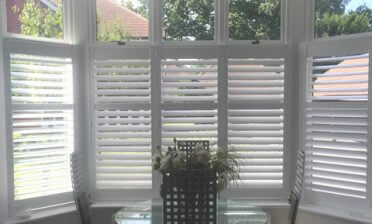 The shutter panels feature 89mm louvres with no tilt rods, creating a clean and modern look over the whole window area. Although made in a full height style they actually have a hidden mid split which allows for even more adjustment of the louvres top and bottom. 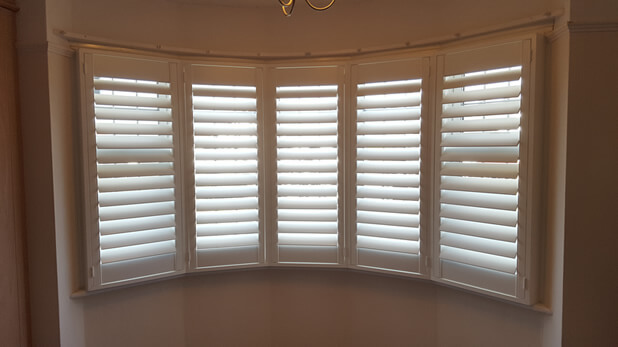 The shutters were finished in a lovely silk white with matching hinges and our customer Patrick was very impressed with the way the shutters stood out as a feature of his bedroom!